CORONA, CA (September 4, 2018) – MAVTV is your ticket this Fall to an exclusive off-road series starring some of the most accomplished drivers on the planet and featuring a supporting cast loaded with aspiring stars guaranteeing close quarter, bone shaking racing. Note: An heartfelt apology to Short Course racers – every race series has its stars but there are also many drivers who constantly strive to take their place. They are the backbone of the sport. “Wanabe” was a poor choice of words – but certainly not meant to offend – (Stuart Rowlands). The Lucas Oil Midwest Short Course League makes its MAVTV debut on Tuesday, Sept. 4, at 6 pm ET. This 16-part, one-hour weekly show will same-day re-air at 9 pm ET. 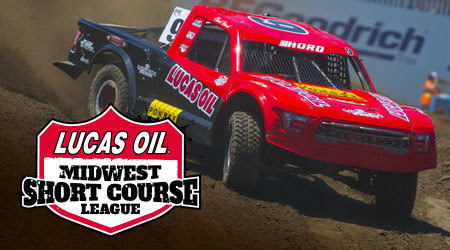 The Lucas Oil Midwest Short Course League will showcase the talents of top rated Midwest off-roaders in wheel-to-wheel action on courses ranging from 1-mile to 1.75 miles in length. Featured tracks include Crandon International Raceway in Crandon, Wis., Bark River International Raceway in Bark River, Mich., and ERX Motor Park in Elk River, Minn.
It’s the kind of down-and-dirty, family-friendly action for which the Midwest is famous. Don’t miss a minute of the action featuring both pros and sportsmen. The Lucas Oil Midwest Short Court League does it in the dirt.